Make event administation even easier and smoother with our fanstic website tools. We provide you with a wide range of tools which you can place on your website, giving your customers a more interactive feel. 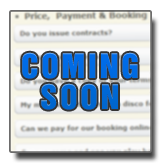 With more and more people booking services online, you need to ensure you have the advantage over your competitors! Our tools will help you gain that advantage! 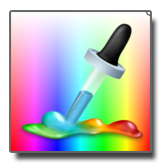 All tools come with easy to use options and we even provide you with the code you need to put the tool onto your website. It couldn't be easier or quicker getting started! The great thing is all the website tools will pass any data collected straight into your DJ Event Planner account, meaning you will never have to double type a client's event details again! Our simple to use styling tools allow you to customize your website tools to match your website. With the option to link to your logo, a background image and pick custom colors, you'll be able to seamlessly integrate our website tools into your website. The live preview system allows you check your styling before saving too, so you can be sure that your choices are correct! The client portal, our flagship website tool, comes packed with features which you can manage from within the administration area. We provide you with a lots of options to customize your portal to your requirements, along with a selection of preset templates to use. If you're an advanced user, you can customize your client portal even further by linking to your own stylesheet giving you complete control of the look and feel! 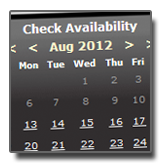 Let your clients see if you are available for their chosen date, quickly and easily! 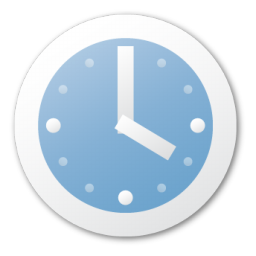 The Date Availability Checker tool allows you to put either a basic form or graphical interactive calendar onto your site; your customers can then select the date they wish to book you and check your availability. 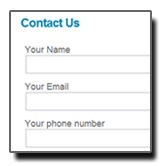 If you are available, you might want to present a form so they can request a quote right there and then. 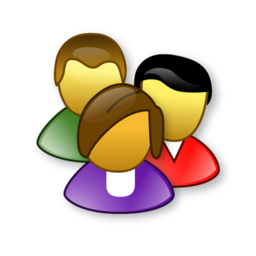 Or if you are not available, you might want to refer them to someone you work with? Thats no problem! You can set up what happens when they select a date, giving you total control! Save your self time and money by getting your Requests for information sent straight to your DJ Event Planner inbox with our Information Request form. You decide what questions you want to ask, and we provide the code to put straight on to your dj website. Then when a client inquires about you, the information is sent straight to your online planning system. No more entering the details manually; no more double typing the data! One click to add the event details, and your admin work is reduced massively! 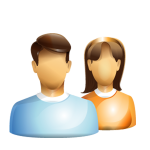 Want to provider your clients with a quick electronic way to contact you? Simply use our Contact Form website tool to get your emails sent straight to your DJ Event Planner inbox! With customizable questions, we'll provide you with the code to put on your website. 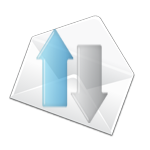 All emails sent from the form are then put into your DJEP inbox; no more searching mutliple email management programs as everything is in one place! 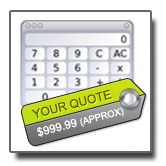 Sometimes your customers want a quick quote! DJ Event Planners website tools can help you provide that information almost instantly. Our quote generation tool allows your customers to fill in some basic details and get an estimate of how much their event entertainment will cost them. The tool forwards this information to your DJEP inbox allowing you to add the event details to the system; you can then contact the customer directly or store the information in your account. Your potential clients may want to browse your music database before requesting a quote, so putting this tool on your website may be a no-brainer! 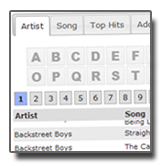 Allow your potential clients to browse through your music database, searching by Artist, Song Title, Genre and more. We even provide you with 3 prebuilt (regularly updated) databases which you can use instantly; alternatively, for the more advanced users you can upload your own database. 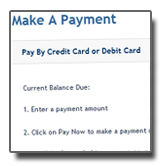 Reduce the waiting time in receiving payments with our payment gateway tools. By allowing your customers to pay instantly online, you can ensure you secure the booking faster than ever before. 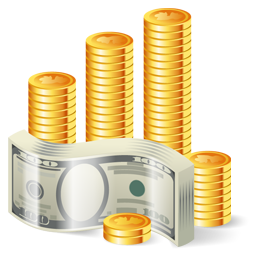 The PayPal system is our standard gateway; however, more advanced users can use their own payment gateway links, if they wish. We also provide a premium feature to assign any PayPal payments made to the event/client details, so you can see who's paid what and keep track of your finances with ease! One of our most popular features is the Guest Request system. The Guest Request System can help increase traffic to your website, increase awareness of your business, and most importantly increase your potential client base! You can set up a secure area where your clients' guests can come along and put in a request BEFORE the event. This allows you to see what sort of music this event might prefer, allows you to personalize your set before the event, and also gets potential customers talking about you! Due at the end of 2012, you'll be able to add a Frequently Asked Questions (FAQs) section to your website if you don't already have one. This tool will allow you to create your own customer questions and answers in DJEP, we'll then provide you with the code to paste into your website HTML code. You'll also be able to style the FAQs section if you are using a custom CSS file. Keep a check on the blog for more information about this tool. 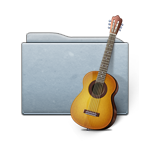 If you do public performances, you may want to share a list of your events on your website. Our Event Calendar tool allows you to copy some simple code into your website, and it will automatically display all your events instantly! 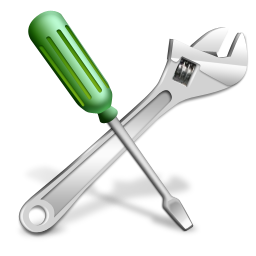 No code refreshing when you add a new event; the tool updates automatically. BLah Blah Blah... we'll do this bit later one!BLah Blah Blah... we'll do this bit later one! BLah Blah Blah... we'll do this bit later one! It's nice to know when you've done well; it's also nice to know what you could improve upon. The Evaluation Form website tool allows you to find this information out. 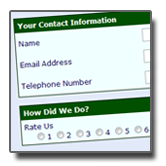 With customizable questions, you can provide your clients with a form asking whatever you want! When they submit the form, it's sent to your DJEP inbox and can also be used to generate reports. If you wish to display your evaluation form results on your website, use our automatically updated Evaulation Results website tool. Each time a form is submitted, and you have this tool on your website, your potential clients can read what other clients felt about your service. Increase your reputation by allowing your potential clients to view past event evaluations; show where you have grown, and more importantly, show how great you are! Social media has taken over, if your business is not on Facebook then it seems you're being left behind! This premium add-on (one off fee) allows you to integrate your client portal and/or request information form into your Facebook page. Allowing your clients to connect with you via Facebook, gives you an advantage over your competitor. You also give your clients more ways to connect with you and to use your services. It shows you're thinking about your clients and guests. Get one step ahead of the game and get social! Tracking and analytical information is vital in today's web world. To provide a better service, it's great to know how your clients found you and what they've used on your site. You can use this data in your marketing and customer service strategies, helping you increase business and make more money! This tool couldn't be easier to use; simply enter your Google anaytics ID in the administration area of DJEP, and we do the rest! All the information is then sent to your Google Analytics account! You can now have your tools match your websites style making integration more seamless! Give your clients a quick way to log in to their event, simple copy and paste the code we provide into your website! It couldn't be easier! 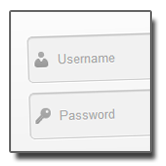 You can also customize the style of the client logon/portal too!. Our main website tool, the client portal was rebuilt from the ground up in 2012 and we've added some fantastic features (Check out the client portal page for more information). Keep your diary clear of conflicts and let customers check your availability. We have a range of pre-styled widgets you can place on your site or you can use the classic style drop down box! Again, with a gallery to choose from (or style your own) you can ensure your tools match your website style. The Check Availability tool can inform your potential clients if you are free or not... if you are, then it can send your customer to your contact form, instant quote generator or a URL of your choice! 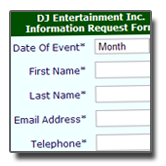 Get information requests sent directly to your DJ Event Planner inbox by using our contact forms! Ask your customers the questions you need to give an accurate quote, add their event to your account with one click and reply to them straight away! Super quick, super easy. You can use our standard form or customize it with your own questions! 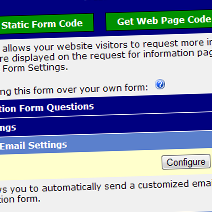 Again, we also provide you with a few ways to integrate the forms into your website too! Save time by giving your customers a quote straight away, directly on your website. This unique tool allows you to take the event details from your potential customers and give them an approximate cost for their wedding, birthday, party ...etc. The information is then sent straight to your DJEP inbox, allowing you to follow up on the quote! 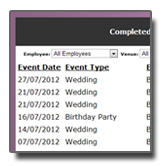 Like the request for information form enquiries, you can add the event detals to your account in one click! Sometimes customer want to view your datase of songs to see if they like what they see! Now you can offer them this facility! 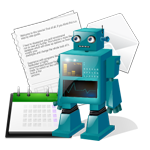 We provide the code and you copy & paste it to your website! It provides your customer the chance to view by artist and song! It also gives your customers the chance to invite guests to your website to view your database, so they can check to see if you can cover their special requests on the night! 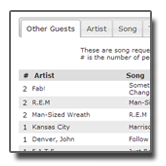 Alternatively, why not use our Guest Request system and allow the guests to make requests online BEFORE the event. Guests are provided with a password and can logon to a special area just for them. And because the guest requests come in early, you'll be able to ensure you have their song! The Guest Request system uses styles from the CSS files used in the client portal, so you can style the Guest Request area however you like. Still not sure? Think about it... more visitors, more enquiries! Following up after the event can be a tedious job! You want to get feedback, but sometimes you don't get the time to contact the customer! Perhaps you don't currently have an evaluation form. 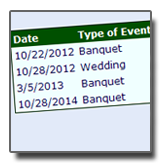 DJ Event Planner evaluation forms are easy to set up, and can be automatically sent to your customer after the event! You can then store the information or provide links for other customers to read your reviews. 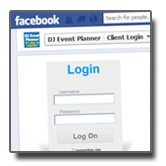 DJ Event Planner can also connect into some 3rd party tools such as facebook! We offer custom made dedicated facebook apps for your business page, we also offer integration into Outlook, Google Calendar and Apple Calendar. 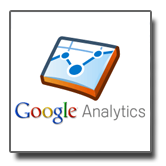 You can also add your own google anayltics ID so you can track and analyize your vistor statistics.